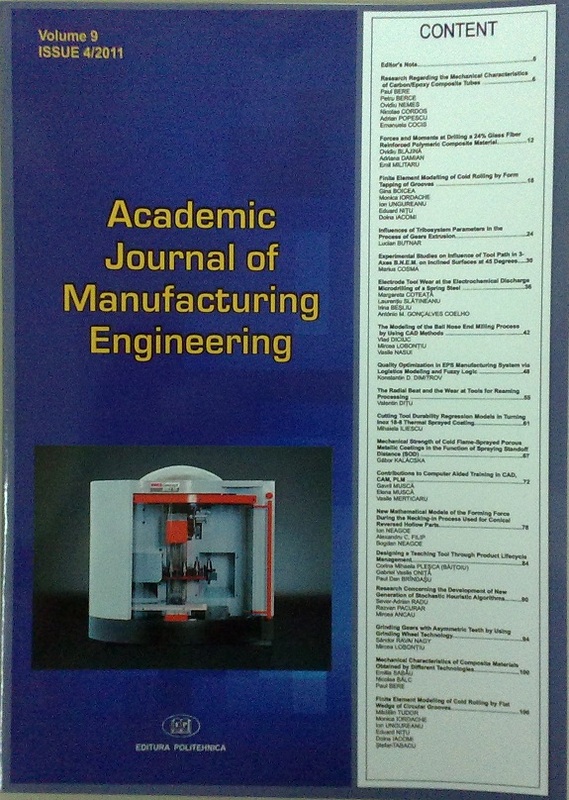 Academic Journal of Manufacturing Engineering is a scientific journal published by the Academic Association of Manufacturing Engineering(AUIF - Romanian acronym), which was founded in 2002 by manufacturing sciences specialists within Romanian universities. Other people involved in manufacturing and related fields, coming either from higher education and research or industrial companies have joined AUIF in the following years. Nowadays, AUIF is one of the important scientific and technical associations in Romania, trying to promote new results and modern approaches in manufacturing sciences and any other related fields. The editor of Academic Journal of Manufacturing Engineering is professor Petru Berce, from Technical University of Cluj Napoca, Romania. The Academic Journal of Manufacturing Engineering intends to provide the specialists in the manufacturing engineering field a possibility for sharing and exchanging results and information by publishing the results of their work. The Academic Journal of Manufacturing Engineering is published quarterly (4 issues/year). The currently submitted papers will be published in the first number of the journal on 2013 (March 2013). An international scientific committee will review the submitted papers. You may find here the paper template. Academic Journal of Manufacturing Engineering is recognized as a B+ journal by the Romanian National Council of Scientific Research and indexed by Index Copernicus international database. No publication fees will be charged for the accepted papers.